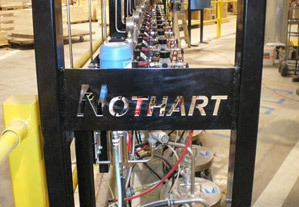 Nothart Engineered Sales Ltd. is a customer focused sales agent/product representative for over 50 different industry leading brands. Our specialty is to size, spec, sell and service everything from Boilers and Blowers to Pumps and Finishing Equipment and from Fans and Mixers to Valves and Nozzles. Generally speaking, we work with Consulting Engineers, Mechanical Contractors, Plant Engineers, Maintenance Planners, Production Managers, and many other folks who keep our society going day to day. We have experience in dealing with lots of different industries such as Municipal, Industrial, Instructional, Manufacturing, Hospitals and Mining to name a few. We are involved in all types of process, which include, and are not limited to, Lift Stations for sewer systems, Vacuum Pumps for food processing, Paint Lines for automated kitchen cabinet or farm tractor manufacturing, Mixer applications for the Mining industry and the list goes on. We like to say that if it goes up and down or round and round ... we're all over it. Learn more about Nothart and What We Do.